Ian and Chris Talbot, two well known Empire Premier 1 players, come from a table tennis family. The father, Des, and all the six sons played. The boys started playing in primary school. Ian, Ross, Geoff and Chris won the Wellington Primary Schools Boys Singles Titles. Ross won the Primary Schools Singles three times and was only 9 years of age when he won for the first time in 1965. Ross won the Wellington Senior and Junior Secondary Schools Boys Singles in 1970. Des Talbot took over the running of the Porirua Table Tennis Club. The family dominated the Club Singles Title. Des, won the title when it was first held in 1969, and also 1975. Ian won in 1970 and 1972-73. Ross won seven times,1971,1974,1977-78 and 1982-84. Murray won 1980-81. Chris won eight time, 1985-92. Only non family members to win were Tony Rutledge (1976) and Steve Corbett (1979). Chris Talbot still has the cup as the Porirua Club folded up after 1992. The Talbot brothers had their own basketball team in the Porirua league, with Ross and Bryan the stars. Bryan went on to represent Porirua . Ian, Chris and Bryan have run marathons. Ian has run 20 marathons with a best time of 2 hours 29 minutes 16 seconds (London 1981). Ian has also run triathons and been on the Round Taupo Cycle Challenge (160 km) 3 times. Chris played senior cricket for North City and caught NZ opening batsman Bruce Edgar out. Murray, Ian, Ross and Chris all represented Kapiti at the NZ Championships. Murray, Ross and Chris have all been the top ranked man in Kapiti. After the Kapiti Association folded up Ian and Chris joined the Empire Club. Chris has played Premier 1 since 1994 and Ian from 2000.They were in the Empire team that finished runner up in Premier 1 (2009). They have both won the Empire Club Singles. Chris 5 times (1999-2001, 2003, 2006) and Ian (2005). And together they have won the club doubles 10 times (1999-2006, 2009-2010). 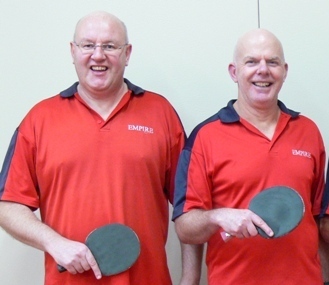 Ian and Chris Talbot have represented New Zealand in the veterans table tennis test against Australia at Easter. Ian has won the NZ Over 45 Men’s Doubles twice, with Lindsay Ward (2003) and with his brother, Chris (2008). They have had much success in the NZ Masters Games in Wanganui. Ian has won 12 Gold Medals and Chris 10 Gold medals.